First I must apologize for this review being fairly late, compared to other outlets. 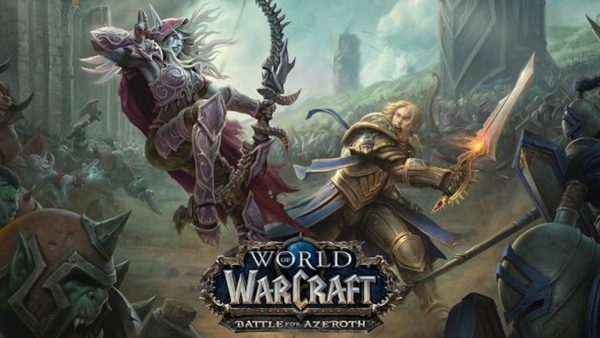 Most sites seemed to rush a review out for World of Warcraft: Battle For Azeroth within the first week or two of the expansion’s release, which seems counter-productive. Core gameplay systems weren’t even released until just a few weeks ago. That’s why I wanted to take my time with it. Do the new raid a few times. Do some island expansions, a Warfront or two, and really digest it fully. With that said, it’s been over a month since the expansion hit and so far, it’s been a real mixed bag for myself and the community-at-large. You all should know how World of Warcraft plays by now. So, instead of detailing the general points of the expansion, I’m going to go down a list of the new features and give my thoughts on them. The big “new” mechanic in BFA is the Heart of Azeroth. This is an artifact necklace that is meant as a replacement for the artifact weapon system in World of Warcraft: Legion (the past expansion). In Legion, you directly powered up your weapon with artifact power. Then, unlocking new skills via a skill tree on the weapon itself. If you wanted a specific skill/talent early, you could really go for it and plan a route to unlock it. In BFA, there is no skill tree. There is just a flat level associated with your necklace. Instead, you find Azerite Armor that has special abilities on it that you can pick up if your necklace level is high enough. Generally, the armor falls into the head, chest, and shoulder pieces, though I imagine more armor slots might open up with additional patches. For example, say you got a shiny new headpiece that has some Azerite slots open you can actually use. You really only have four or five options per piece of gear, per level. It operates on this weird-looking ring system where the outer ring has the most options available to you (based on your specification). The middle ring has fewer options, and the centerpiece only has one option. Also, different rarities of gear have different numbers of rings. For example, a rare (blue) piece of gear only has three rings. While an epic (purple) piece of gear has four. More rings mean more talents to unlock, thus making this piece of gear more useful as well. Put simply, this system barely works. I think the idea was to tie Heart of Azeroth into the armor to make it feel more impactful. However, this doesn’t happen at all. Mainly due to the paltry amounts of Azerite (artifact power) you get. I’ve been playing pretty much daily since release and I only have a level 20 Heart of Azeroth. 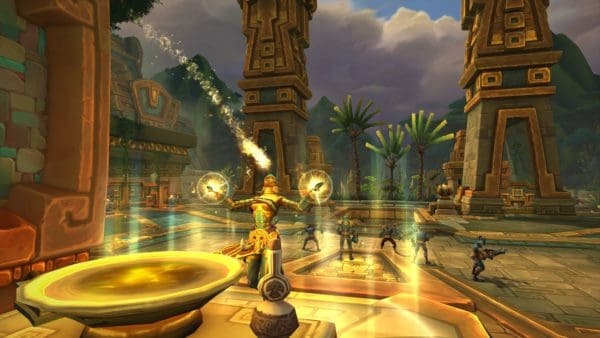 Most world quests give out between 150 and 300 Azerite. You can get bigger chunks when raiding or doing Warfronts but that caps out at around 1,000. Getting to the next level with my necklace (I’m at 42% already), left me needing 7,797 more Azerite. This means a whole lot of grinding just to get to a new level. Granted, Legion had this problem with the artifact weapons as well. However, because you were actively unlocking things ON the weapon, it felt more interactive. The second big part of BFA are Island Expeditions. These are (basically) scenarios where you and two other players go to an island map and try to get more Azerite than the other faction’s team. The island is full of monsters which drop Azerite and you can also mine it from certain nodes, or destroy rare mobs for even more of it. The other faction team is made up of NPCs (which can be killed) to slow down their progress. 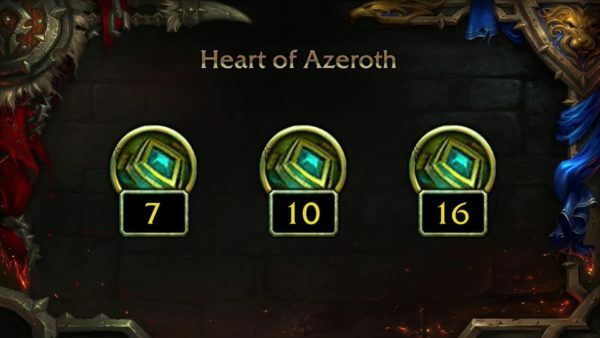 The first team to get to 6,000 Azerite, wins and gets some paltry rewards. First, these expeditions are not fun. The maps are bad, there’s little to no coordination, the rewards are terrible too. Honestly, it’s completely boring. I didn’t even know you could get anything OTHER than a small amount of Azerite from these expeditions (like mounts, pets, other cool stuff) if I didn’t watch a video where a guy showed off that you could. It’s all just randomized drops, and in the 10 expeditions or so I did, I got nada. You also can’t even pick what island you want to do, there are three options that swap out weekly. But you can’t specify (or I couldn’t find a way to) a choice of one map over the other. 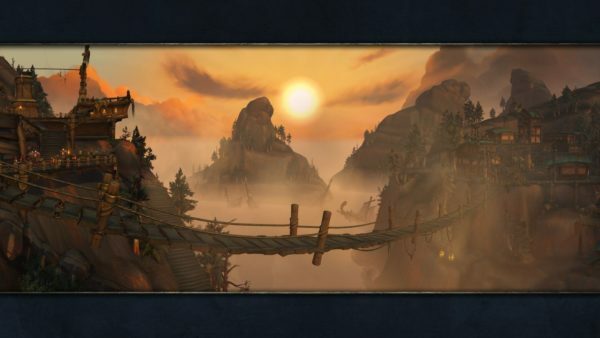 Blizzard tried talking about Expeditions as this grand adventure where you could go to an unknown island, scout it out and take it over for your faction. Instead, you and two other random players (you can group with friends if you want to, but I never did), just hit an island and kill random NPC’s until you win. And You always win. I’m 10 for 10 in the Expeditions scorecard because they are so brain-dead easy. So far, Blizzard is 0 for 2 when it comes to new expansion features, so how do Warfronts stack up? They are a bit of a mixed bag, but I’m leaning slightly toward the positive side. Warfronts are basically an expansion of Timewalking status only for zones. Sadly, only Arathi Basin is actually up at the time of writing. But they have retooled the old zone from launch WoW (circa 2004) to a modern area with appropriate levels of monsters and a whole lot of rares for you to slaughter. And boy, is it a slaughter, the first Warfront I did, there were so many Alliance players hopping on that any rare monster or World Boss was almost instantly ganged up on and killed. It ruled. Then after the first day of all the bloodshed, it went away. You can only kill the rare monsters and World Boss once per two-week interval. After two weeks, you’re on the building side. The Warfront itself changes hands every two weeks. One side has it “active” where you get to kill monsters and other things in the zone. The other side has to gather resources like cloth, ore, food to be able to queue for a 20 man raid where you have to take out the enemy commander of the base. You do get a fair amount of Azerite for doing these quests but that’s about it. This part I’m a bit iffier on. You and other players have to capture points on the map to get resources to bolster your base defenses and to spend on offensive machines/troops. In the one I’ve been able to do (remember, there’s ONLY been one, as I write this), it was a bunch of Alliance players running around with their heads cut off as no one had a clue what to do. Warfronts biggest problem is the two week long wait time. 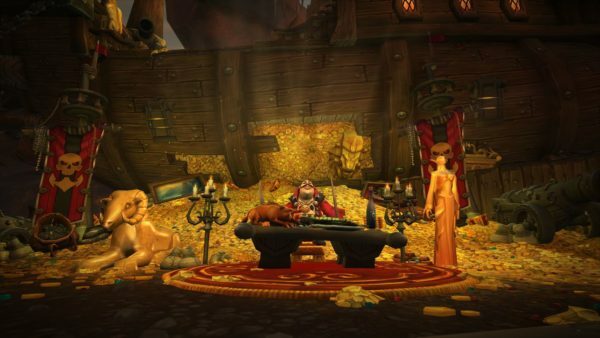 Blizzard has said that they’ve made mistakes with how it launched, and also that they are adding more. This is sorely needed. They’ve said that the idea is that there will be multiple Warfronts and that if one zone (like Arathi Basin) was on the resource part for Alliance, then another zone (like Feralas, another example) would be “active” for Alliance, and vice versa for the Horde. If that was their intention, then at least two zones should have been ready at launch. Instead, it feels like some half-baked idea that could be great, once they get their act together. The one thing I’m somewhat excited by are the new zones and the overall story. 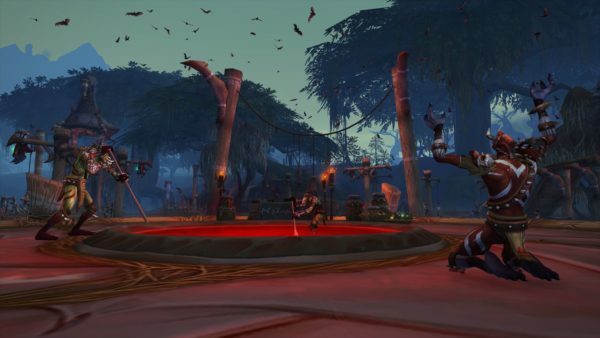 There are two new mini-continents, Kul Tiras (Alliance) and Zandalar (Horde). 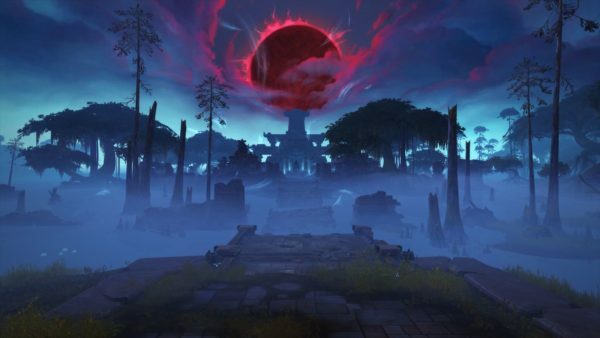 Kul Tiras is home to three zones Stormsong Valley (very hilly zone), Tirgarde Sound (home to an English-style manor estate) and Drustvar (A Halloween-style zone with a lot of witches). 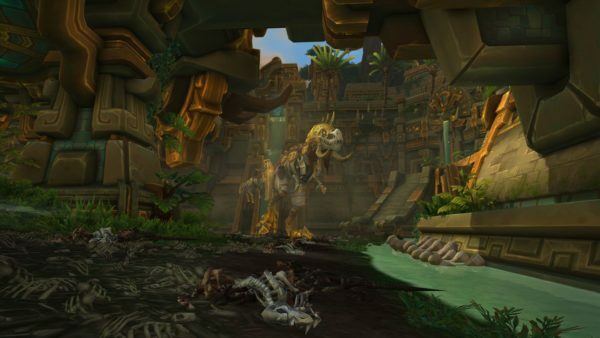 Zandalar has Zuldazar (think Un’Goro Crater, without the crater), Vol’Dun (a desert zone), and Nazmir (swamp zone). Each zone is fairly distinctive and has good art, but a few of them are a real pain to get around. Side note: I can’t speak on the new Horde city but the Alliance one, Boralus is a nightmare to get around. It’s a confusing mess of a town, that even after a month, I still have trouble finding basic things like where the trainers are, or how to get around on the walls. Also, like with the story, I can’t speak on the Horde front, but the Alliance campaign is pretty decent, if not unsurprising. The story focuses on Jaina Proudmoore returning home (to Kul Tiras) and being found a traitor to the navy there, which is headed up by her mother. However, there are some machinations going on and it’s up to you to figure it out. It more or less works. Jaina hasn’t been a real pivotal figure for a while now, so it’s nice seeing her back, even though her hair has some weird white parts in it. The story itself is fairly basic but provides enough of a backdrop to what is going on. Hopefully, when future chapters are released they actually can tie the Alliance deeper into it, since so far, they feel somewhat removed. Honestly, the best part of BFA, by a longshot is the inclusion of War Mode. Blizzard has ditched the notion of PVP (Player vs. Player) servers, so now there is the War Mode. You can toggle PVP status on or off in either Stormwind or Orgrimmar. If it’s on, you can be killed by other members of the opposing faction in the game world, and if it’s off, you can’t be. There are some superficial benefits to having it on, quests give a tad more experience and rewards but that’s nothing. Frankly, this is the BEST part of the expansion. I play a Mage with not a ton of survivability when it comes to PVP stuff. That, and I just don’t like PVP’ing in the game world (if I do partake, it’s usually in Battlegrounds), and I’ve been on a PVP server for the past eight years since someone hacked my account and transferred me to a different server. I’ve been getting ganked by Undead Rogues and Orc Death Knights for years now. 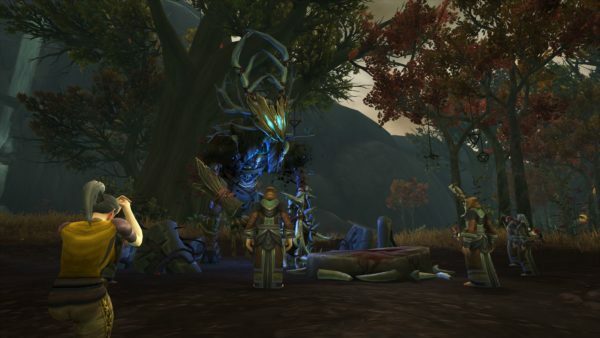 There were areas in Legion, particularly Valdisdall and Thunder Totem that the SECOND you landed, you would get dropped by a Horde “welcoming” party. To me, this is what really saves the expansion and the game. This section will go over some of the smaller changes. Each thing doesn’t require its own section, so this will be a tad quick. Item Squish: They did another item/number squish, scaling the numbers of gear/spells/abilities/HP/MP down dramatically. This is probably needed as Legion numbers got to be really inflated/insane but certain older WoW bosses seem harder for some reason. This system has had problems, so I’m not sure if they’re all ironed out or not, but it’s slowly getting better. New Races: They’ve added a few new races (but not classes) to the game, each with their own specializations. Void Elves on the Alliance side are good magic users. While Mag’har Orcs on the Horde side have increased pet health. You have to complete some pretty hefty requirements to unlock certain races, which might turn off players who haven’t played WoW for a while. New Dungeons: There are around 10 new dungeons in the game, and at least a quarter of them feel awful. Specifically, Waycrest Manor and Tol Dagor are awful and Freehold isn’t much better. Tol Dagor, Freehold and Atal’Dazar re-use maps from the world (or specific scenarios) as the dungeon map. Tol Dagor is perhaps the most insulting since it’s a stupid prison, square-shaped map that is completely boring. The raid might be interesting but once you’ve done each dungeon once, you probably won’t want to do them again. Overall Score: 6.0 out of 10 Battle for Azeroth feels like a half-finished expansion. It is quite possible Blizzard had to rush it out the door at a certain date and couldn’t delay it. The raid is fine, but there’s only one, and a large number of people have already done it. The Azerite system is semi-broken, expeditions are lame too. And while I like where the story is going, it just kind of stopped halfway through with a “To Be Continued” sign hanging there. Warfronts are neat, in theory, but because there’s only one of them now, it also seems not done. Don’t get me wrong, I’ll keep playing the game, not having PVP anymore makes me sure of this, but most of the additions that BFA added to the game don’t actually feel good at all. But, like with any MMO score, this is always subject to change with patches and content updates.